Managing Money :: Worth It ... Not Worth It? Worth It ... Not Worth It? Simple & Profitable Answers to Life’s Tough Financial Questions aims to demystify complex, real-world dilemmas and break down the answers into simple, Do This/Not That solutions. Organized around six basic topics-Getting Started, Shelter, Automotive, Investing, Family Matters, and Retirement-this handy book is the Swiss Army knife of personal finance. Credit or debit? Rent or buy a house? Buy or lease a car? Take or decline the rental car insurance? Renovate the kitchen or finish the basement? Buy stocks or mutual funds? 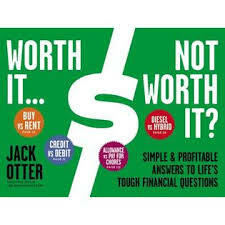 This book breaks down the pros and cons of each of "Life’s Tough Financial Questions" in an easy to read and often amusing way. Jack Otter, executive editor of CBS MoneyWatch.com, has a knack for breaking down complicated financial issues and helping people get control of their wallets and investments.